I went to Erawan at Dataran Sunway in Kota Damansara the other day to try out this Thai restaurant with my friend. But when we stepped into the restaurant, my friend dropped a bombshell. She told me she's full and could not eat anything! I was like, what the .........?! Why the heck did she agree to go dinner with me then? How was I going to try all those dishes that I wanted to try eating alone? This appetizer was simply delicious! 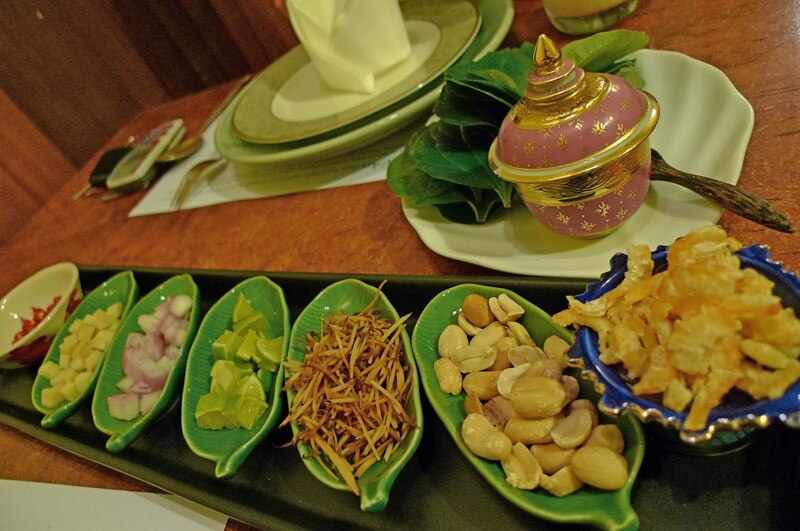 For the uninitiated, mieng kam is a popular Thai snack. 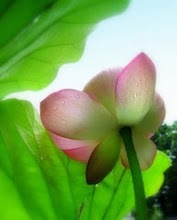 It is made up of 7 different ingredients which you placed onto a leaf. After filling the leaf, you add some Thai fish sauce on top, fold up the leaf and put into your mouth. Yummy!! 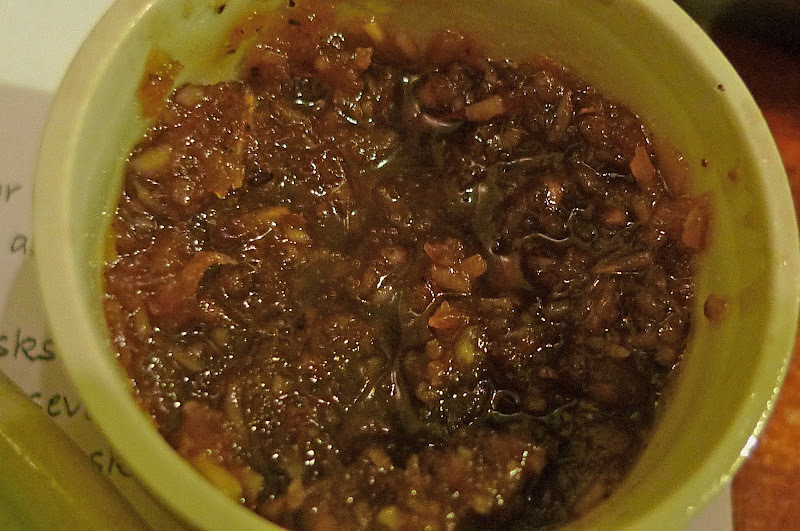 I think the difference with Erawan's mieng kam is its super delicious sauce!! Look at how concentrated the sauce is! 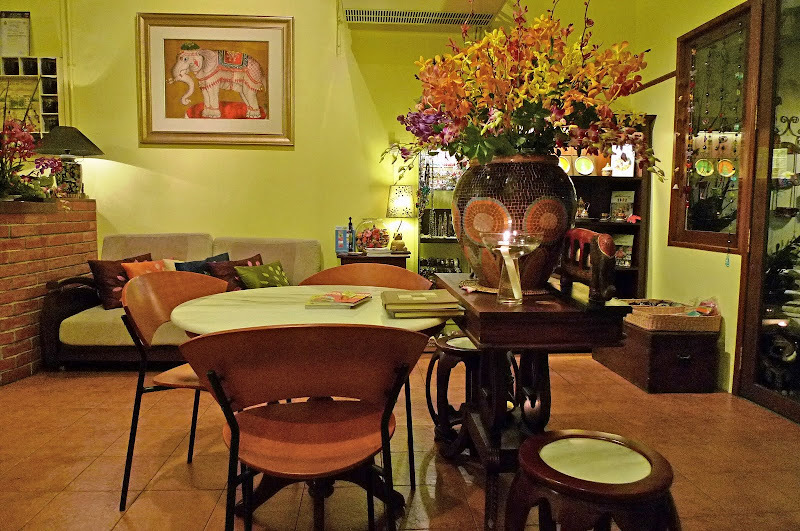 Unlike most other Thai restaurants which provide a more watered down (diluted) version. But of course the mieng kam came at a price - RM20 to be exact! Rather expensive, don't you think? Tom yam noodles in clear soup - This I ordered all for myself. I like the taste of this spicy and sour soup! But most importantly the prawns were fresh and noodles springy. It was good but I thought RM20 for a bowl was a little too expensive! I was already quite full since I was the one doing most of the eating. But that's not going to stop me from ordering Thai desserts! My friend took a small scoop of the durian with some sticky rice and said it was nice! Well, I agreed with her but it still could not match the one I had in Bangkok a few years back. If any one of you go Bangkok, do not miss the very delicious durian with sticky rice sold by this Thai lady at the Food Court located on the 6th floor of MBK Shopping Mall in Bangkok. I actually told the restaurant owner about this but he insisted that many people from near and far go to his restaurant for this dessert! 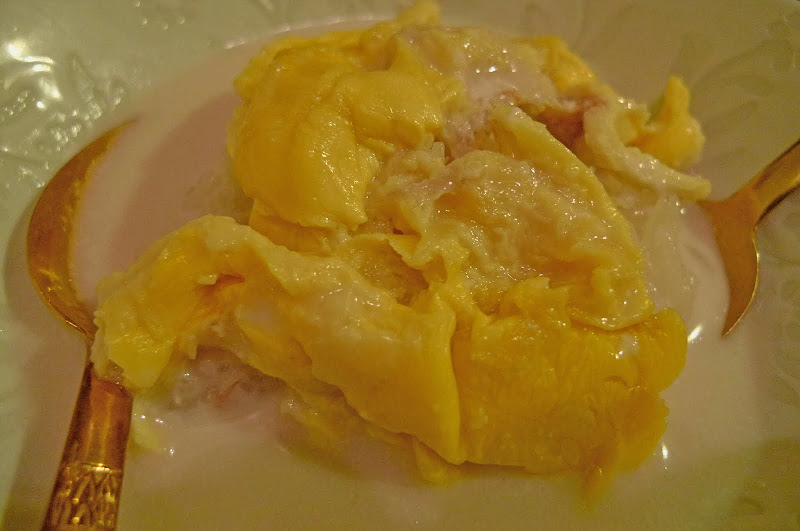 Well, it was probably the best durian with sticky rice in town or even in Malaysia but definitely not the world. Haha! Anyway, this delicious dessert burnt a RM12 hole in my pocket! I think it was much, much cheaper eating it in Bangkok! OK, must plan for a Bangkok trip next! LOL! Apart from the delicious food, I found the ambience in this restaurant really, really nice! There's a smell of lemongrass (I think) lingering in the air as you step into the restaurant. Service was good and the owner was willing to explain in detail each dishes and gave his recommendations. For drinks (sorry no photos) my friend ordered pineapple lassi (RM12) and I went for honey lemongrass drink (RM8). Not bad - I liked the lemongrass drink! All in all, the damage came to RM72 nett. Pretty expensive especially since it was me who was doing most of the eating, but I would say the food was of high quality. 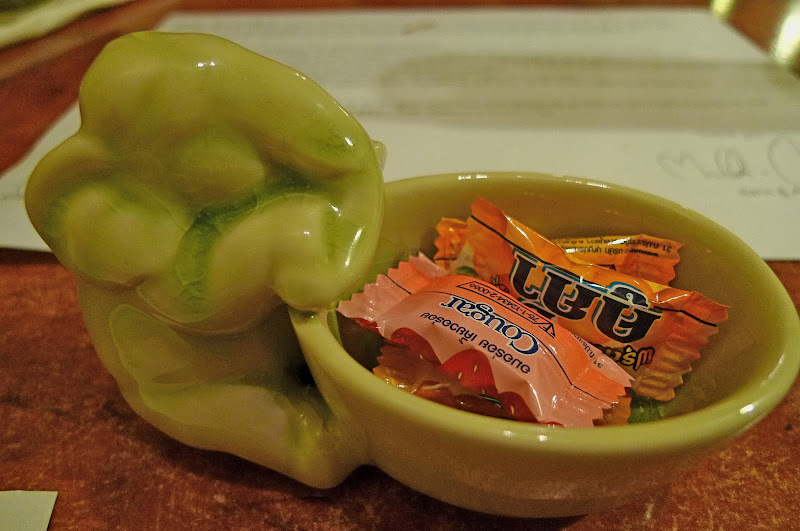 That's the green elephant giving us sweets to tempt us to return. So will I go back for another visit? Most definitely! Besides, I have yet to try most of the other dishes in the menu but I would need a few friends for that! Now since I am not paid to blog about this restaurant, and since I do not want too many people to know about this place (it's OK, call me selfish!) I am not going to share the address with you all. Haha! I love Thai food. The ones in my city don't offer appetizers. My favorite is Pad Thai. I order it every time at any Thai restaurant. I also love their papaya salad. I have Thai friends who say that real Thai papaya salad is ultra spicy and they were not lying! I tried one homemade version and it was HOT! It was so hot that I didn't even know how best to get rid of the heat in my mouth. I just kept eating ice to cool it. I am not crazy about Thai food but I do like mieng kam and tom yam soup (in clear broth). The place sure looks nice. eh tom yam in clear soup? mcm not ngam dy d name! LOL hows d taste actually?? What do you think if we sell apple with sticky rice? The place looks nice - which accounts for the prices they charge. But then again, Thai food in an authentic Thai restaurant is never cheap though mostly the food is really nice. And you're right, eating with more (hungry) friends is more fun. These days, I don't go for Thai durians anymore. Our local strains are much tastier- and they are in season again. Yippee!! where is this place? i love thai food!! i've never tried durian sticky rice.. I miss savouring mango sticky rice! except for tom yum. i never try Thai food before. 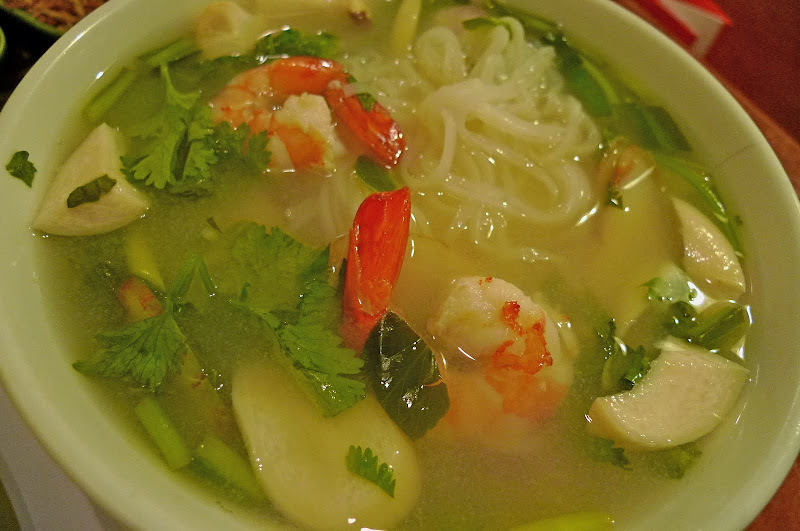 Clear tom yam soup? First time seeing this. hahaha!! that's really really uncool of your friend!! how can she promise to go dinner with you, and finally not eating any?? yeah, kind of expensive to pay RM72!! maybe can go somewhere less classy and have nicer food - for two times already!! anyway, at least the restaurant looks cosy and comfortable, with nice decoration, just not really that Thai to me only..
ok, don't have to let me know where this restaurant is.. not interested as the food is expensive, and they have durians in there!!! i hate durians!!! do they serve sticky rice with mango? Ad you ended up eating alone? RM20 for appetizer? Wow...never mind..since you are so rich. durian with sticky rice should be nice, last time my family like to eat durian with pulut. Yey! You are blogging again Foong. Well that is so delicious. I suddenly went hungry when I read your post. Oh well, it is time for lunch here. i wonder how the durian with sticky rice taste like?? durian is a fruit right?? so durian with sticky rice is a dessert?? your friend just want to spend time with you, not your money. Thanks a lot for the details of this eatery.The restaurant is certainly pretty.The food looked yummy.It sure is expensive.But then if one has to have good,tasty and quality food then in most cases one has to spend more. Very tempting indeed, I feel like having thai sometime soon. aiyo! Panda can eat so much one! sticky rice for dessert.. sooooo filling! but yeah lor.. quite expensive eh? so finally you went there! 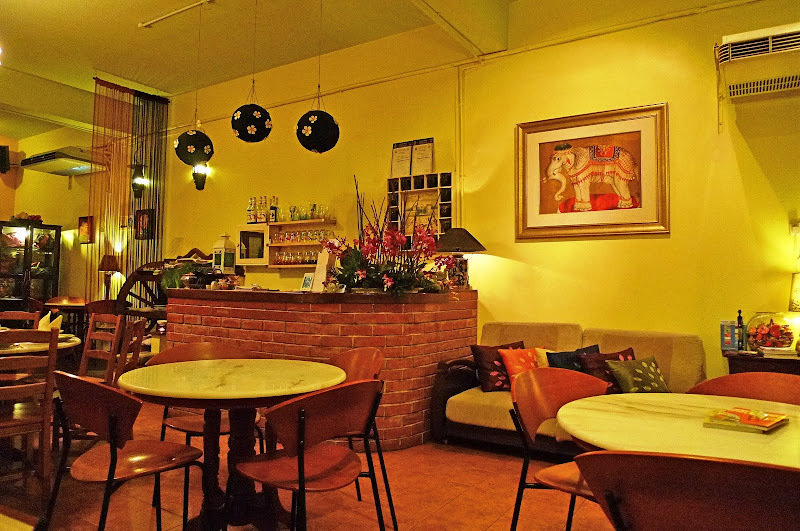 The thing that I liked the most in this Thai restaurant is its appealing look. The food is served in a decorative fashion. The sauce is a bit sticky which is looking to be spicy too. Whatever it might be, I hope you enjoyed the food there. Bye. Thanks for sharing. I just love Thai food. The food looks very yummy and delicious. 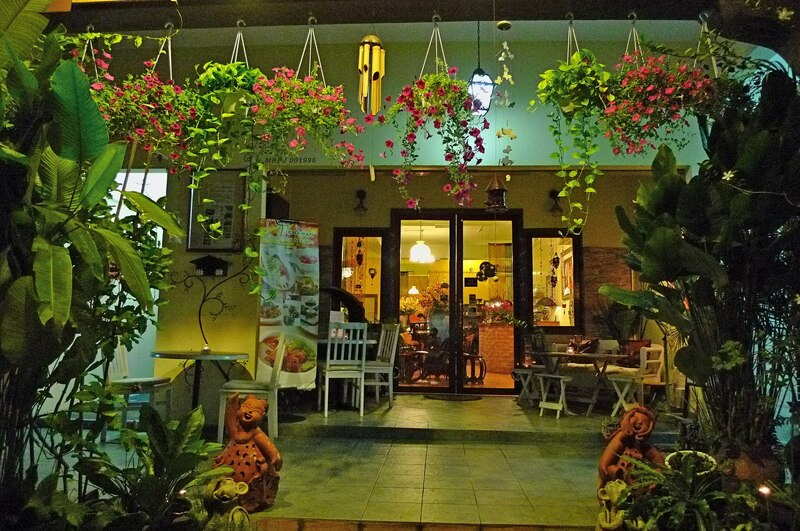 The restaurant also has a very nice ambiance and is dimly lighted and beautifully decorated..